The initial function of acute inflammation is to recruit leukocytes from circulation. These are primarily neutrophils, followed by monocytes that differentiate into macrophages or dendritic cells. The inflammatory response proceeds with the degranulation and activation of local mast cells and macrophages, and the release of a variety of pro-inflammatory mediators, including bioactive amines (histamine and serotonin), cytokines (IL-1 and TNF-α) and chemokines. The resulting vasodilation and increased vascular permeability allow the extravasation of leukocytes and plasma to the site of injury or infection. Neutrophils then move along a chemotactic gradient created by cytokines and components of the complement pathways (C5a in particular). 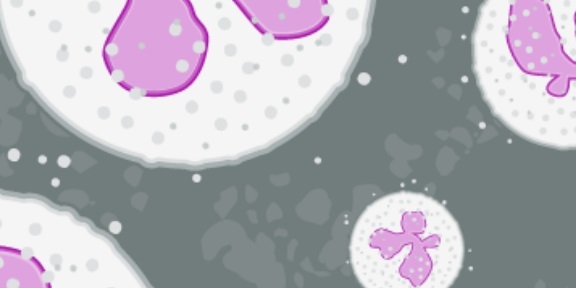 Recruited neutrophils will attempt to destroy the inflammatory agent to eventually elicit resolution and healing. If the initial acute response is unable to remove the inflammatory agent, or if intracellular checkpoints are defective, chronic inflammation can occur. Unresolved chronic inflammation is a core component of a range of chronic conditions like autoimmune and neurodegenerative diseases. The pathogenesis of several such disorders is linked to the long-term production of cytokines1–4. The exact cause and progression of chronic inflammation remains less well defined than in acute inflammation. Measuring the effects of various cytokines is essential for understanding the communication between cells involved in inflammation. It is common for a single cytokine to act on several types of cell, often leading to a cascade of increasingly complex outcomes. Myeloid cells such as dendritic cells, monocytes and macrophages secrete pro-inflammatory cytokines that activate naive CD4+ T cells5. 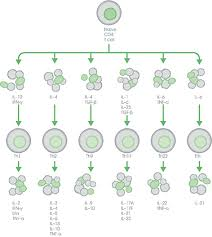 These can then differentiate into different T helper (Th) cell subsets based on the specific cytokines released4–8. Cytokines are generally pro- or anti-inflammatory, and the balance between these determines the outcome of an inflammatory response4. IL-1β, IL-8, and IFN-γ for example, are pro-inflammatory cytokines involved in early responses and the amplification of inflammatory reactions. Anti-inflammatory cytokines like IL-4, IL-10, and IL-13 limit inflammatory responses. Differentiated T cells continue to respond to and produce their own cytokines leading to a complex network of interactions and a variety of physiological responses. CD4+ T cells secreting only IL-17 for example, are elevated in inflamed portions of the colon of patients with ulcerative colitis, which is associated with a decline in Th22 cells producing only IL-229. Figure 1. Cytokines responsible for the differentiation of specific T helper (Th) cells during inflammation and the cytokines these cells subsequently secrete. Targeting these inflammatory cytokines forms the basis of therapeutic treatments: Crohn’s disease was targeted initially using anti-TNF-α therapy (infliximab – a chimeric monoclonal antibody (cA2) against TNF-α)10. However, novel drugs designed to neutralize other cytokines, such as IFN-γ (fontolizumab) and IL-17A (secukinumab), have been unsuccessful or even detrimental to patients with Crohn’s disease11,12. It’s clear that cytokines do not operate in isolation but rather in a network of activation and suppression. Assessing inflammatory responses via the measurement of individual cytokines can often fail to reflect this complexity. To overcome this, utilizing a multiplex assay or array is highly effective as it captures the diversity of secreted cytokines. This allows for the analysis of hundreds of targets simultaneously. Abcam offers cytokine proteins for use as differentiators and also antibody arrays and ELISA kits, including SimpleStep ELISA, for the measurement of secreted cytokines. 1. Calabrese, F. et al. IL-32, a novel proinflammatory cytokine in chronic obstructive pulmonary disease. Am. J. Respir. Crit. Care Med. 178, 894–901 (2008). 2. Dinarello, C. a & Kim, S.-H. IL-32, a novel cytokine with a possible role in disease. Ann. Rheum. Dis. 65 Suppl 3, iii61–4 (2006). 3. Lee, Y. The role of interleukin-17 in bone metabolism and inflammatory skeletal diseases. BMB Rep. 46, 479–83 (2013). 4. Neurath, M. F. Cytokines in inflammatory bowel disease. Nat. Rev. Immunol. 14, 329–342 (2014). 5. Kopf, M., Bachmann, M. F. & Marsland, B. J. Averting inflammation by targeting the cytokine environment. Nat. Rev. Drug Discov. 9, 703–718 (2010). 6. Dong, C. & Martinez, G. J. T cells: the usual subsets. Nat. Rev. Immunol. Poster, (2010). 7. Kaplan, M. H., Hufford, M. M. & Olson, M. R. The development and in vivo function of T helper 9 cells. Nat. Rev. Immunol. 15, 295–307 (2015). 8. Azizi, G., Yazdani, R. & Mirshafiey, A. Th22 cells in autoimmunity: a review of current knowledge. Eur. Ann. Allergy Clin. Immunol. 47, 108–17 (2015). 9. Leung, J. M. et al. IL-22-producing CD4+ cells are depleted in actively inflamed colitis tissue. Mucosal Immunol. 7, 124–133 (2014). 10. van Dullemen, H. M. et al. Treatment of Crohn’s disease with anti-tumor necrosis factor chimeric monoclonal antibody (cA2). Gastroenterology 109, 129–135 (1995). 11. Reinisch, W. et al. A dose escalating, placebo controlled, double blind, single dose and multidose, safety and tolerability study of fontolizumab, a humanised anti-interferon gamma antibody, in patients with moderate to severe Crohn’s disease. Gut 55, 1138–44 (2006). 12. Balzola, F., Cullen, G., Ho, G. T., Russell, R. K. & Wehkamp, J. Secukinumab, a human anti-IL-17A monoclonal antibody, for moderate to severe Crohn’s disease: Unexpected results of a randomised, double-blind placebo-controlled trial. Inflamm. Bowel Dis. Monit. 13, 27–28 (2012).